Are lights under a car illegal? Customising cars is a craze that shows off your car but that’s not normally the case during the night. 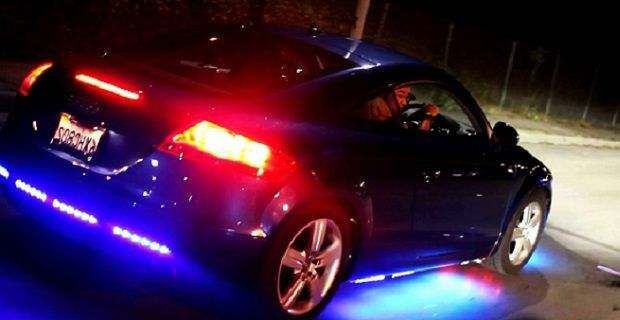 Lots of customizers turn to neon lights under the car to get attention in the dark evenings but are lights under a car illegal in the UK? This question is basically asking what the current legislation states. To answer that you could wade through the pages of information presented on legislation.gov.uk under the “The Road Vehicles Lighting Regulations 1989” section. There you’ll find a long list of dos and don’ts under the subheading “Regulations covering the fitting of lamps, reflectors, rear markings and devices.” This covers everything you’d ever need to know about the car’s brake lights, head lights and all the other lights needed to meet the laws of the road but there’s nothing specifically set out about lights under the car. That seems a little odd given that underside lights are nothing new in the UK. Some police officers who don’t have a great grasp of the law may stop you and ask questions. The web’s full of stories of such incidents. The stories tend to end in the same way as the officers tend to take some advice and decide that the lights are not illegal. The basic rule of thumb with underside lighting on a customised car is that none of the light’s tubing can protrude from the car. That makes a lot of sense because there are obvious dangers attached to having a heat source such as a neon light protruding from the car. So as long as the only thing emanating from the car is the light, you’ll be fine.